Yahoo email reset: How to sign up for someone else's old email address. 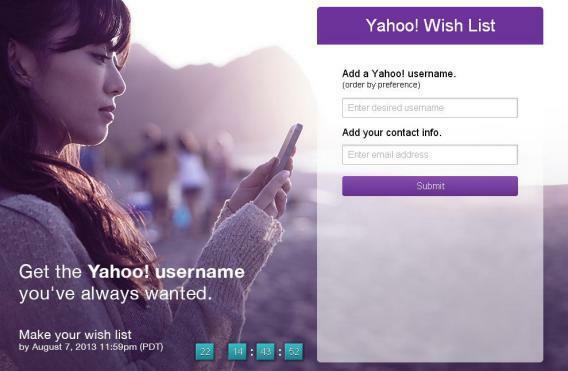 As of Monday afternoon, Yahoo is letting people request other people’s old email addresses. Under a plan greenlighted by CEO Marissa Mayer to gin up fresh interest in the once-popular service, any address that has lain fallow for a year or more has now been reset and is fair game for a new user to poach. So if you always dreamed of being johnsmith@yahoo.com but had to settle for jmsmith348b@yahoo.com, you might be in luck. Go to wishlist.yahoo.com and enter up to five choices for your new handle, and the company will email you in mid-August to let you know whether you got any of them. The scheme is symbolic of the “reset” button that Mayer pressed the moment she took the company’s top job, one year ago today. As with other dramatic changes, like her ban on working from home, it has drawn criticism, with Wired’s Mat Honan blasting it as a security risk. “It means that people will be able to claim Yahoo IDs and use them to take over other people’s identities via password resets and other methods,” Honan wrote in June. And Sophos security expert Chet Wisniewski told me at the time that the move “cement(s) Yahoo’s position as the least secure large Internet company.” But Yahoo has moved to cover its old users’ backs by setting up an email verification process to make sure new users don’t get messages intended for their address’s former owners. Honan explains the security mechanism here, calling it a “significant improvement” over the old plan, if still imperfect. Security issues aside, the email reset is part of Mayer’s fascinatingly ambitious effort to make Yahoo cool again. It’s a seemingly impossible task for a company that has come to be an emblem for how quickly Silicon Valley giants can fall from the summit. But the effort alone has already won over some investors, who have made Yahoo one of the hottest tech stocks of the past year. An earnings report later today, on the one-year anniversary of the Mayer hire, will tell us more about how much progress the company has made. So too, in a way, will the success or failure of the email reset, which poses the question: Would you rather win the aesthetically pleasing handle johnsmith@yahoo.com, or settle for jmsmith348b@gmail.com and a better email program?